Nothing quite like picking your dinner from the rocky shore of the Atlantic ocean, then serving it up that evening with a slice of homemade bread to soak up the white wine, butter, garlic and onion sauce. 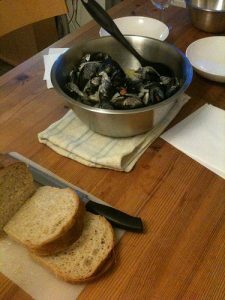 I never thought I’d like mussels, but I do, and picking the enormous ones from the rocks yourself is quite something else, both in flavour and satisfaction. Neil grabbed this catch whilst I did some volunteer trailside maintenance for The National Trust and we plan to head back to the spot to fetch more for an upcoming supper. Delicious, healthy, and sustainable. Why would anyone pass that up?